When your home is surrounded by water on three sides, outdoor space is a necessity to experience the views and community that PIER 4’s Seaport location has to offer. Come late 2018, your future backyard will be PIER 4’s very own lush one-acre park and restaurant patio, a perfect place to take in the sea breeze and experience the best of city living in a seaside environment. 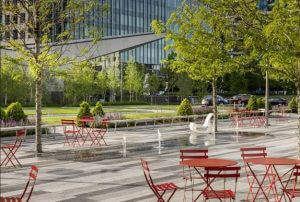 In the meantime, there are many outdoor spaces to enjoy around PIER 4. Below are some of our favorite places close to home which provide the tranquil settings for leisurely activities, from exercising and lunch, to relaxation and family time. Enjoy a seaside stroll along the Boston Harborwalk, which will continue past PIER 4 less than a year from now. Feeling fit? 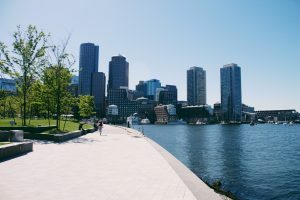 Run or jog along this stretch, which covers Boston’s entire waterfront, from Seaport to Lovejoy Wharf, while enjoying beautiful city and water views as you pass neighborhood attractions such as the Seaport’s Fan Pier Park. The park offers a six-acre marina and more green space. 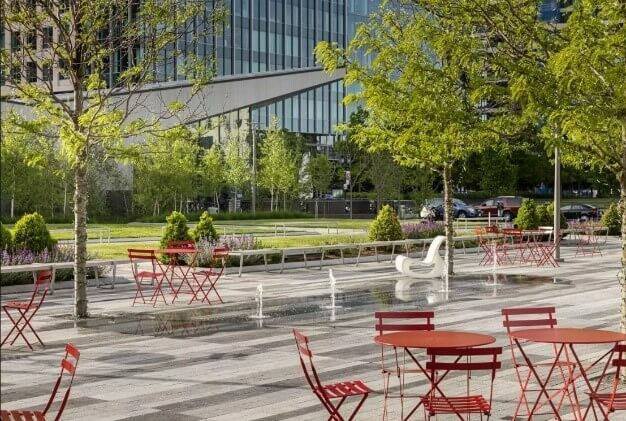 Located steps from PIER 4 and close to District Hall, the Seaport Common is a lovely park in the heart of our bustling neighborhood. 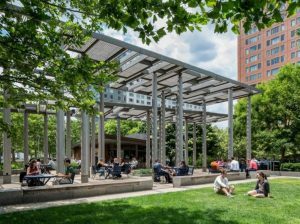 Adorned with tables and chairs, and meticulous landscaping, the common is a great place to catch up with friends, picnic with the family, enjoy a concert, or take your workout outside. It welcomes exciting community and fitness events all year, including the recent Boston Symphony Orchestra Chamber Brass concert. Each summer and fall, there’s a weekly Seaport Farmers Market, and each summer popular exercise series Seaport Sweat comes to the green. 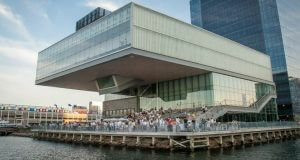 Our neighbor – the ICA – has an amazing Back Deck looking over the waterfront. Head there to catch a glimpse of PIER 4’s progress, enjoy lunch by the water, or to experience the museum’s impressive events and exhibits. No Friday plans? No worries! Dubbed “First Fridays,” the ICA hosts well-attended events with art, music, cocktails and dancing every Friday. During this week’s First Friday on October 6, the ICA will celebrate Boston Fashion Week with an inside look at fall collections from select designers. On October 19 from 7-9 AM, Daybreaker, a group that organizes fitness experiences in 18 cities each month across the country, will come to the ICA to host a yoga session and dance party. With lots of green space, its signature glowing swings, lawn games, and events, The Lawn on D is a wonderful place to spend the day with family and friends. Don’t miss the Pumpkin Palooza on October 18 for Halloween-themed activities for all ages. The Lawn on D also hosts many private gatherings and fundraisers throughout the year. Looking to plan an event? Learn more here. Just a 6-minute walk down Seaport Blvd. from PIER 4, these parks are designed to reflect the area’s maritime past. The parks have plenty of outdoor seating, a café, and a sculpture garden featuring contemporary, marine-themed works by artists including Susumu Shingu, Judy McKie, and David Phillips. Learn more about the sculpture garden here. There are many more green spaces along the waterfront to explore near PIER 4. We look forward to spending time with you at our public park and restaurants along the Harborwalk come late 2018.